Update: This article has been superseded by more recent developments. Since this article was published, the previously advertised launch date for BoxNation was changed on two occasions. It was originally advertised as launching on 24th February, then BoxNation announced it would launch 1st March. 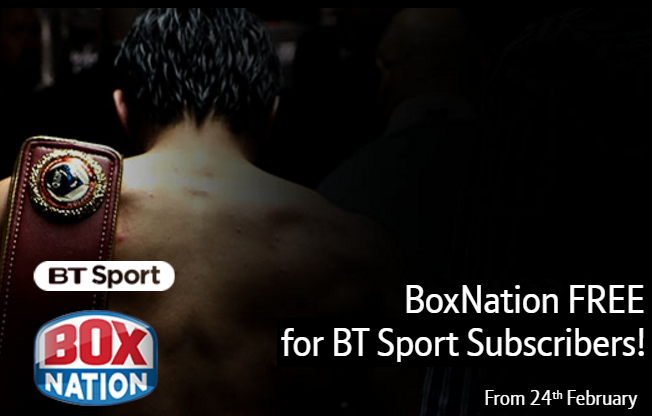 The BoxNation service went live on 20th February 2017 on BT TV. BT Sport subscribers with Sky, BT TV, TalkTalk, or who access BT Sport via the app will gain access to Boxing channel BoxNation from March 2017. The tie-up between the two broadcasters was first announced last year, but since then further details alongside the launch date have become available. While BT Sport subscribers using BT's and TalkTalk's YouView-based TV services or using Sky will benefit, Virgin Media customers with BT Sport are excluded. Anyone with the BT Sport Pack will get BoxNation for free from March 2017, although BoxNation's pay-per-view events won't be included, according to BT. 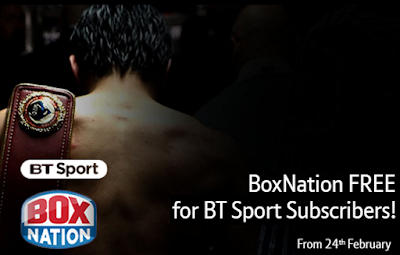 HD pack customers will gain free access to BoxNation in high definition. BT Sport Lite Pack customers will need to upgrade to the full BT Sport pack to gain access to BoxNation. As part of the deal between BoxNation and BT Sport, Saturday night Fight Nights will also feature on the BT Sport channels. As announced on 20th January, BT will start charging all BT TV customers for BT Sport from 1st August 2017. This affects those watching in standard definition, as HD and UHD customers already pay a premium for BT Sport in high and ultra high definition formats. BT is increasing the monthly subscription charge for those accessing BT Sport via Sky from the same date. However, BT says the deal with BoxNation means viewers who previously subscribed to both services separately will save £144 a year.